The Black Trail is the premiere descent and climb in the western finger lakes region. Located in South Bristol, NY and built and maintained by GROC with the help of Ontario County Park operations, it is a centerpiece of the region's riding. Rated as "most difficult" it is really an intermediate trail with some moderate technical features, although it will test your fitness. There are some steep sections and berms, but nothing a confident intermediate rider couldn't handle. One of the most difficult aspects to this trail is the tread, which tends to be very loose shale peppered with roots and "baby head" glacial erratics. Some sections are quite smooth but overall it's fairly rough and a full suspension bike is recommended, although not necessary. This trail is just one of about 12 miles of trails in the park. It isn't the most technical as I would give that honor to the Brown Trail, but it does have the most vert, which makes it quite popular. It can be ridden in either direction or as a figure eight, but the preference for getting the most turns for your earn is to ride it counter-clockwise starting at the jump off. Ridden this way, one will start with a series of banked switchbacks along the edge of steep slope and into gully. The trail will bottom out at this point and climb back up for a short period before starting another descent to the bottom of the valley. The entire descent has a series of undulations and some will require pedaling, others can be rolled if you maintain your speed. Once at the lowest point, the trail loops around and begins a long climb. The climb is not always a climb though as one will find it actually quite fun with quick little descents in between each physically taxing climbing section. 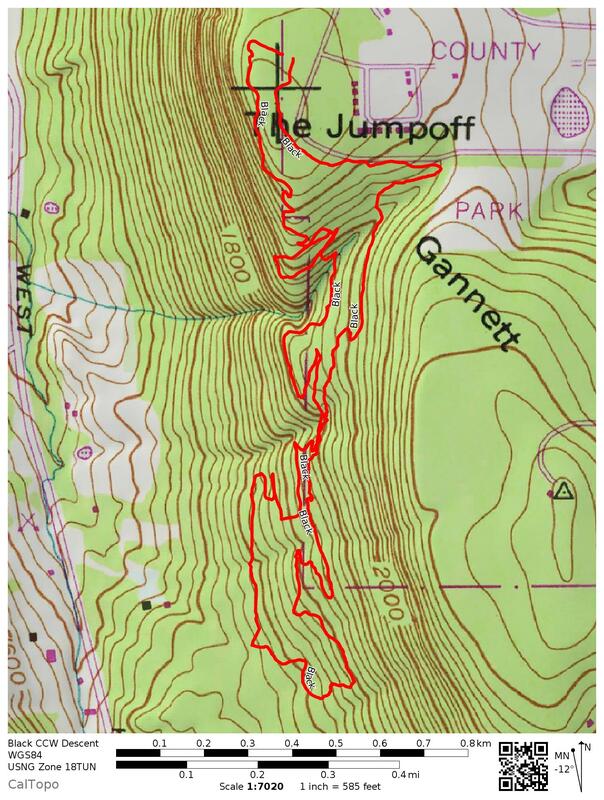 Although from top to bottom, the trail only drops 600' point-to-point, one will find that they've climbed and descended just over 1000' to complete the loop. This extra 400' of climbing and descending really punctuates the trail and makes it more of a cross-country ride than an Enduro run. The entire trail is just over 3.5 miles if run in a loop but coupling it with other trails in the network and/or re-riding in another configuration makes for a good day of riding.